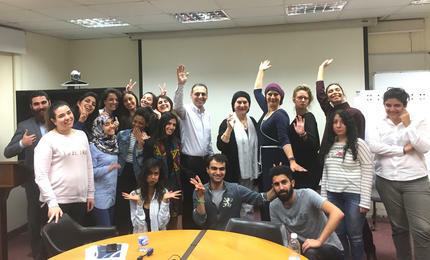 American activist Manal Omar talks to students about inclusivity, pluralism and helping women understand their needs. Omar and Salamey with students from the “Middle Eastern Topics on Pluralism and Inclusive State” graduate seminar. Knowing ourselves and respecting others brings us power as women. That is one of the messages U.S.-based Palestinian activist and author Manal Omar conveyed to her audience during her graduate seminar “Middle Eastern Topics on Pluralism and Inclusive State,” held on LAU’s Beirut campus on November 10. Omar, former associate vice president for the United States Institute for Peace (USIP), is also founder and CEO of Crossing Red Lines, an organization that seeks to empower female leaders by helping them understand their sexual energy within an Islamic framework. 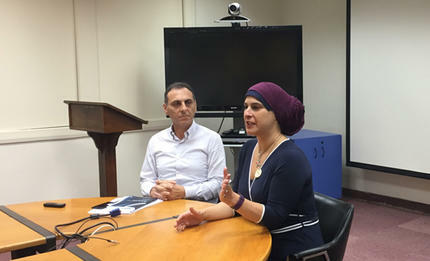 Sponsored by the Institute for Social Justice and Conflict Resolution, the talk aimed to bring students “a gender perspective on inclusion provided by a distinguished expert and practitioner,” said Imad Salamey, associate professor of Political Science and International Affairs and associate chair at the Department of Social Sciences. The attendees from diverse backgrounds, like Omar, included women from Yemen, Syria, Bahrain and Lebanon, and were asked to use their experiences in their home countries to understand how, as future researchers and activists, they can make a difference at the grassroots level. Participant involvement was high. “When you try to talk to women about their rights and they themselves do not accept that they actually have rights, how do you motivate them?” asked participant Mona Saeed, who comes from Yemen. Omar advised Saeed to look beyond the obvious and to dig deeper for a reason that is holding those women back. “Human beings are wired for self-protection,” she explained. “Help them see that they are in a place of safety.” Furthermore, Omar pointed out that people in conflict are usually more concerned about having food on the table than pursuing their rights. The Middle East region, she noted, has never been limited to a single ethnicity or religion — “This is the cradle of civilization,” she reminded the audience. Omar said her work focuses on getting women who are already parliamentarians or NGO directors to the next level of leadership through exercises that help them understand their needs and concerns as well as those of women in general.